oisting it on davits, can become a very damp business if you’re not careful. Leaning right over either end, trying to stretch a cover over the wet bow and stern pods can quite easily result in a head-first dip in the drink. Britannia’s dinghy is an old model C10X Caribe RIB, ten feet long, so at least it has a solid floor to scramble about in. Soft bottoms are not as stable, so the chance of slipping overboard is greater. After disembarking any passengers at Britannia’s side ladder, I would then hand walk myself in the dinghy to the stern, where someone on deck would tie the dinghy’s painter to the rail. The outboard motor could then be lifted off the dinghy transom using our crane hoist, and locked on it’s mount on the stern rail. I should add that the height to the aft deck on Britannia is comparatively high at six feet. The dingy cover would then be dropped down to me—usually in a big pile—whereupon the shenanigans would begin, gleefully anticipated by anybody standing on the stern with a camera. First I had to find the rear of the cover, then, leaning perilously over the dinghy stern, drape it over the end of each pod. 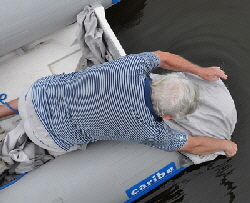 This was made more difficult when I occasionally decided to leave the outboard on the dinghy, since the cover was then a tight stretch over the outboard casing. Still, it was a comparatively easy operation compared to the bow, because the cover was loose as I leaned over the stern. But even then, just one rogue wake from a passing motor boat—it’s always a passing motor boat isn’t it? and I had to hold on for dear-life to prevent myself slipping head-first over the stern. I know this can happen from experience—twice. Raucous laughter from onlookers didn’t help either, who couldn’t even think to throw me a line as I swam to the side boarding ladder! With the back of the cover hooked under the stern pods, the next operation was to hand-paddle the dinghy to a position where I could grab the hoist line hanging from the davit, then pass it though the rear grommet hole in the cover and snap its carbine hook to the ring in the wire strop, bolted to the transom. I would then maneuver the cover to the bow, always keeping tension on it to prevent it washing off the stern pods—or I would have to start all over again. The cover then had to be stretched over the bow by leaning right over to hook it as far underneath as possible. The problem with that was I was always obstructing the cover with my own body. This is another prime opportunity to get a soaking. 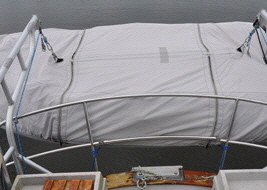 With the cover hooked over both ends I would again hand paddle to where I could grab the bow hoisting line hanging from the davit, pass it through the front grommet hole in the cover and hook it to its strop. 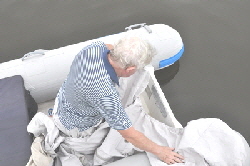 Even with the dinghy now secure I could only straighten the cover on the outward side, because I had to squeeze out the other side to climb up the stern boarding ladder. I considered cutting the cover in half to make two separate bow and stern sections, then zipping them together when both ends were in position. I’m sure this would work for others, but trying to attach two halves of a zip is difficult enough on land for my old hands, never mind in a lurching dinghy with wet fingers. I would have needed to stretch both halves together while balancing in the center, trying to zip the sections together—and I only have two hands. Still, I felt I was possibly on the right track, so I progressed to a better solution. I had our local canvas man sew twin zips 4’ feet 6” inches apart from the side of the cover to the middle, which gave me a sizable “flap” to work in. It is now even beneficial to leave the seat in position, which I previously had to remove to give me more “crawl room”. With the flap open the cover also stretches easier on to both ends and I can then sit on the seat to effortlessly connect the davit hoists. I can also easily exit up the stern ladder by leaving the flap unzipped. I also had small loops fitted on the ends of the zips and the other side of the cover. 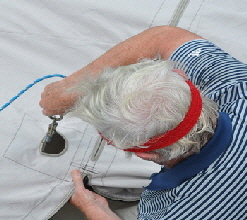 I tied lengths of thin blue cord to the outside loops, so when the dinghy was hoisted on the davits I could hook the dangling cords with a boat-hook and thread the ends thought the loops in the zip. These cords kept the middle of the cover from blowing about in a wind. 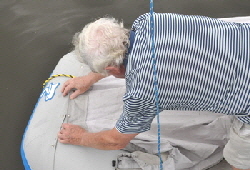 Having hoisted the dinghy to the top of the davits, it is then a simple matter to zip up the flap. Another advantage of having the flap became apparent the first time we needed to stow our fenders in the dinghy, which we couldn’t easily do before, when the cover was on. It is now an easy matter to just unzip the flap, stuff all the fenders, and/or mooring lines, in the boat, then zip it up again. This was an all round marvelous improvement, which was well worth the $75.00 to just have two zips fitted to the cover. 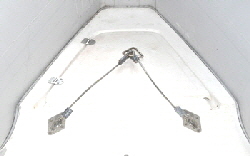 But then I incorporated yet another modification, which was available on my dinghy, but I have not seen on other makes. Even when the cover was wrapped as far under the bow as possible and hoisted on the davits, it would frequently be blown off by strong winds and slip off the bow where it would flap incessantly until stretched back into place. On Britannia this was another perilous operation, because I had to lean right over the davit to be able to wangle the cover back under the dinghies bow, with a very real possibility of falling completely off Britannia’s stern. 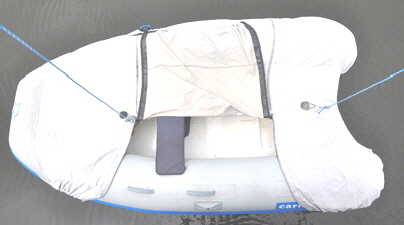 Luckily, the Caribe C10X model has a strip of canvas across the bow with five metal grommets which are used to attach a spray hood. I pop-riveted press-studs into these grommets and also the cover, then I trimmed the front of the cover off completely. Now, instead of having to lean right over the bow when fitting the front of the cover, I simply snap the five studs together for a safer and much more secure attachment which so far as not been blown undone. Finally, looking at the pictures you may think, “Why has he got a flap on both sides of the cover?” This is a fair observation, especially since I always lift the dinghy the same way round and a flap on the outer side of the cover is indeed superfluous. So why two flaps? The answer is; because the canvas man stitched the first set of zips on the wrong side of the cover, so he took it back and did it again, so I got two flaps for the price of one! I have never used the other flap, but I suppose when the plastic zips eventually crack in the hot Florida sun, as they surely will, I can reposition the outboard motor and crane on the other side of the stern, then just turn the dinghy round and use the other flap. After all, on boats it’s always good to have a back-up, isn’t it?